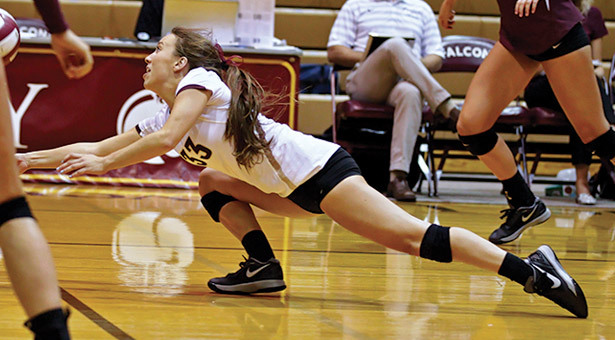 Senior volleyball libero Breanne Wiekamp became this fall the eighth Falcon to have made 1,000 career digs. Men’s soccer moved into November with a No. 9 ranking in the division. Seattle Pacific University’s men’s and women’s soccer teams and the women’s cross country team all qualified for their respective NCAA championship events this fall. 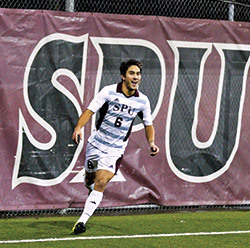 The men’s soccer team secured a second straight Great Northwest Athletic Conference crown. Their 14-1-3 regular season record (10-1-3 in the GNAC) and No. 7 national ranking were rewarded with a fifth straight trip to the NCAA tournament for coach Mark Collings’ team. Those 11 victories included a 4-0 rout of rival Western Washington University and a 3-2 win against Simon Fraser University, bringing them even with the Clan after a 1-0 loss in Canada just 12 days earlier. Seattle Pacific’s women are in the NCAA Tournament for the 13th year in a row. On November 7, they played in their third straight GNAC title game — all of them against Western Washington — although this one went 3-1 in the Vikings’ favor. When the Falcons, led by conference Player of the Year Hannah Huesers, kick off their NCAA opener, they will step onto the field with a 13-4-2 record (7-3-2 GNAC). After a fifth-place finish at the GNAC Championships on October 24 in Bellingham, the women’s cross country team raced to fifth at the NCAA West Regionals on November 7 in Monmouth, Oregon. That gave the Falcons a spot in the Division II nationals for the third time in four years. Senior Anna Patti was fourth among the 192 runners at regionals and led SPU. She also won three regular-season races. Cross country nationals are set for November 21 in Joplin, Missouri. On the volleyball court, senior libero Breanne Wiekamp came up with her 1,000th career dig on October 15 against Central Washington University, making her just the eighth Falcon to reach that mark. SPU’s volleyball program celebrated its 30th anniversary on September 26 with a party and a 3-0 sweep of Western Oregon University in Royal Brougham Pavilion.